DONETSK, Ukraine -- The queue stretched for one and a half kilometer. It is hard to wait in a traffic jam when you are running away from war. Semenivka, Donetsk Oblast is one of towns that has been severely damaged as a result of separatist forces being pushed back by the Ukrainian army after two months of occupation. When people in Semenivka heard the fighting was coming to their hometown, most of them decided to flee. 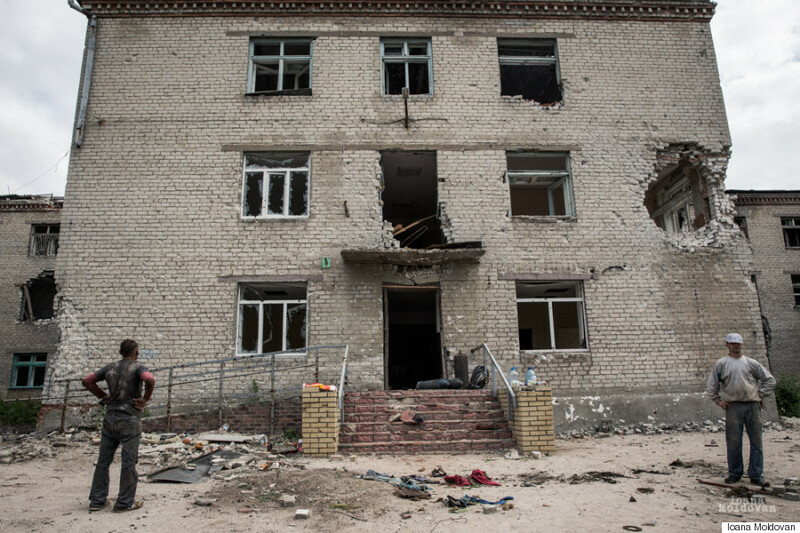 One year later, Semenivka looks like the fairyland of mice, riddled with buildings like swiss cheese castles. “All our belongings were destroyed. We don’t have bed linen, we don’t have a fork, we don’t have a spoon.” Natalya Beskorovana’s words, a 35-year-old from Semenivka, condense the everyday reality of the majority of Ukrainian refugees or internally displaced persons. While the fighting in Ukraine is placed in some sort of quarantine in the East, life in other parts of the country is moving along almost undisturbed. Peace and war are enjoying a more than strange cohabitation, so the true impact of the conflict is far from being obvious. The numbers can take many people by surprise: one year after the war started, there were over 1.35 million internally displaced people in Ukraine, ranking the country 9th worldwide in terms of IDPs. There are over 900,000 refugees to the neighboring countries and the estimated number of people in need of humanitarian aid reaches 5 million. “We used to have animals before the war, pigs, chickens and ducks. And a vegetables garden. How can I explain it to my child that we don’t have anything anymore?” Natalya Beskorovana complains. At the UNHCR distribution center in Kramatorsk, a town about 100 km (62 mi) north of Donetsk that was last shelled in February this year, the stacks await like every other morning. Outside, some 20 people line up in the sun to get their turn at blankets, bed linen, candles, pots, diapers and some clothes. But only if they carry the document proving they really are IDPs. In order to get the IDP status and thus be eligible for some benefits from the state and from humanitarian organizations, people need to register with the Ukrainian social protection department. Actually receiving it may take months. The process faces many other challenges as well. Short distance displacement is one: people move from their destroyed home, but because they do not leave to a different administrative unit than the one specified in their internal passport, they cannot become IDPs. Another is when the conflict moves: there are areas around the frontline which the government does not recognize as territories not under its control and does not include them in the official decree stating the origin towns where IDPs come from, so people running from these areas can’t receive the status and benefits. It is also the case for students and unaccompanied minors, who cannot register without the presence of their legal guardian. “Of course we need more help; we hope for displacement benefits and money for the child, as now we are really in need,” says Oksana a 32- year-old from Kirovske, Donetsk Oblast. She is holding the hand of her 7-year-old daughter, Anastasia, and carrying Maxym in her arms. Maxym is only 3 months. She was sick at the time she was close to deliver, so Oksana could not leave Kirovske, Donetsk Oblast earlier to come give birth here, in Kramatorsk. Now, she has to go to court to apply for Maxym to be admitted as a Ukrainian citizen, as he was not born on Ukrainian territory. It is the only way they can receive the post-birth benefits. Now, Oksana and her family live in a one room rented flat. It is all they can afford. The rent has gone up big time, but there are also many cases of locals renting their flats to IDPs for free. They only have to pay for the utilities. The young 29-year-old woman arrived in Kramatorsk after the big explosion in Donetsk. In order to go back and visit her mother who stayed in Donetsk, she needs a frontline crossing pass. She paid 1,000 hryvnia and got it in two days, when the official way can take up to one month, maybe even more. Iryna’s patriotic feelings are very strong. “Of course there are arguments between people,” says Andrej Nicolaevich, a civil activist. People in Semenivka argue about rebel fighters’ tombs. On the side of the road, where separatists were killed, some people placed crosses and other religious symbols. Others wonder if it is alright to have such “monuments” for them. “Of course, people were killed. But they were not ordinary people, they were separatists,” some locals think. At the end of an almost deserted street, a cloud of dust starts taking shape. The gravel makes way for the bicycle wheels. A man in his late 40s hops down and props his bicycle against a green metallic gate. Its green color is spotted by black and rusty holes. Recent ones. Behind the gate, a broken armchair reigns in what once was Viktor’s living room. “I have left when the fighting broke out,” he said. The separatist forces occupying Semenivka for two months dug their trenches right in front of his home, some 200 meters (656 feet) away. With Ukrainian army positions set 2 kilometers away on the same direction, his house was directly in the line of fire. “The situation was quite good under the rebels,” Viktor recalls. There is some bad blood as well between Oksana Korchma and the army. The 45 year-old then living in Myrnoe, a suburb of Slavyansk, is convinced the shelling that destroyed her house came from the Ukrainian army’s positions. And imagine this: it happened just three days before the city was liberated. Oksana sighs thinking about last year’s events. When the shelling started, she was in her nightgown. They went to the basement to take cover and did not even realize the house above them was burning. Three days before the city of Slavyansk was liberated, the house of Oksana Korchma was burned. She and her husband take care of 10 minors, out of which seven are adopted. Oksana recalls the terrifying moments following them getting out of the basement, how she had to walk barefoot through the mined field, in her nightgown, holding the family dog in her arms fearing the mines. The ideological arguments between people are not the only ones tearing families apart as a result of this conflict. Olga Ovsyanykova’s husband stayed back in Donetsk while the family fled to Svyatohirsk. He has a job there, working at a railway station and it is the only way he can make some money to support his family, Olga and their epileptic daughter, Tanya. In Donetsk, they lived very close to the airport, the epicenter of fighting. When the water and electricity were cut, Olga decided to take her daughter to a safe place. They first went to Syedove in the southern part of Donetsk region, close to the Azov Sea, then to Novoazovsk before settling in Svyatohirsk. Svyatohirsk is a small town, 30 kilometers (19 miles) north of Slavyansk. In better days, it used to be a resort town. Not so much these days. Now, almost all the strangers in the town are IDPs, not tourists. Mayor of Svyatohirsk for eight years, the independent Alexandr Dzyuba says that his town hosts over 10,000 IDPs, while the population is 5,000 people. During tense periods with intense fighting in the East, there were more than 15,000 displaced here. Dzyuba believes that the reasons for which IDPs choose this town is because Svyatohirsk has never been occupied and there’s an orthodox monastery here, an important factor for many, in the mayor’s opinion. The Svyato Uspeska (Holy Mountains) Lavra is an orthodox monastery under the Moscow Patriarchate. It is also the place where many IDPs were given shelter. Elderly Galea, 78, from Avdiivka is one of them. Head covered and clad in long skirt-dresses, as required by the monastery’s code, Galea rests on a bench during her evening walk. The old woman lost her husband shortly after the fighting in Avdiivka started. His health severely deteriorated because of the shelling and he died. She feels good in the monastery, has free food four times a day, the people are hospitable, she does some work in the kitchen, but she misses home. Not all her memories from Avdiivka are pleasant though. The most recent ones, with her younger 13-year-old nephew flat on the floor, completely afraid of windows breaking and walls moving because of the shelling, are certainly not among them. It is terribly hot in the tiny two-room apartment that Olga and her daughter now occupy in the Holy Mountains collective center for IDPs. Boiling steam relentlessly comes out of the electric kettle Olga is using every time she needs to cook something. Tanya is obsessively pulling on each and every member of the orange plush teddy bear she holds in her arms. Svyatohirsk, as a resort town, has no plants, no productive units that can create jobs. Many locals leave the city in search of a better future in other towns. So the only opportunities for IDPs are the temporary summer jobs. The needs of the internally displaced are changing with time passing. In the beginning, they only needed safety, shelter and some food. Now, the challenge of integrating them in the communities they found refuge in arises. But how far this can go does not have only economic implications related to the possibility or lack of possibility to create new jobs, but also political implications. What comes to mind is whether integrating the IDPs could symbolize giving up on Donbass. For the time being, locals have a rather positive attitude towards the IDPs. “It is ok with me. I feel sorry for those people who had to leave their homes. They find themselves in an unusual and very difficult situation,” says Valentyna, a young local woman working in a grocery store. She is a 43-year-old housewife, born in Donetsk but married in Svyatohirsk. How these relationships between the locals and IDPs will evolve if the conflict is prolonged, how will competing for jobs feel in towns already struggling with high unemployment rates, remains to be seen. Meanwhile, the Ukrainian solidarity is something to look up to. “It was good in Ukraine when it was Ukraine,” Iryna adds in a nostalgic tone. The psychological effects of this war are obvious. And they’re not only apparent in Kramatorsk kindergarten — shelled twice — where children are ducking to the floor when they hear loud noise. They’re also apparent in the tales of families who lost everything and are being constantly mentally challenged. Thousands of families have fled their besieged towns, moved among strangers and now they are confronted every day with the choice of whether to start fresh, rebuild their life in this new place or wait for the war to be over and the possibility to return home. For some, though, the return home depends not only on the war ending, but also on its outcome. It is the case of Julia Lomakina, a 39-year-old IDP working as a volunteer at the UNHCR distribution center in Kramatorsk. The majority of the displaced want Donetsk and Luhansk regions to stay in Ukraine. Others though, fed up with war and homesick, end up saying this is not important anymore: “Of course we want to stay in Ukraine. We were, are and want to be Ukrainians. But we just want peace, and if it will be different, it does not matter, because we just want to have bright blue sky and no shelling. I want to go back home, not to Russia, but home,” says elderly Halea from Avdiivka. Olga Ovsyanykova is homesick too. She says “I miss my home” with sorrow in her voice and starts to cry. Olga hopes and even believes that the two regions will be again in Ukraine.